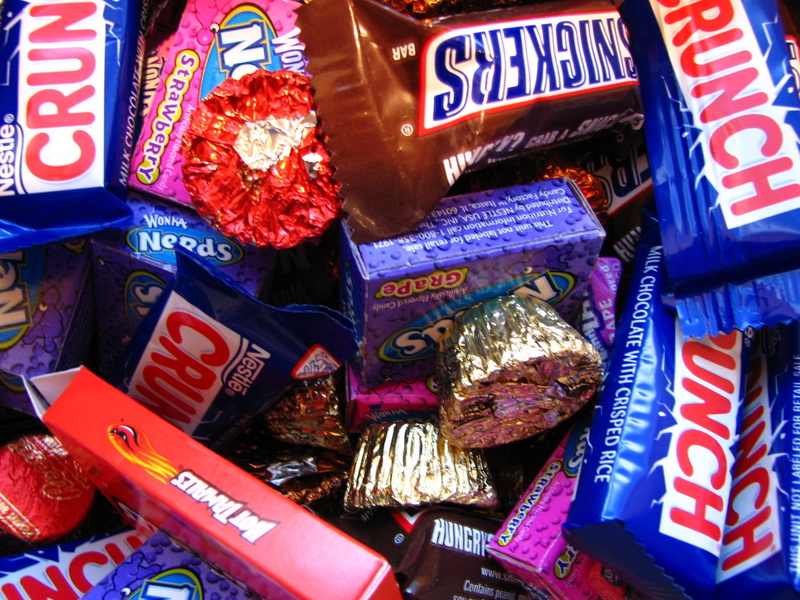 There are healthier alternatives to toxic Halloween candy. Halloween is just around the corner. This night of ghosts and ghouls brings along with it something even scarier than the costumes…candy! The heavy pillowcases filled with enough candy to feed a third world country of my childhood were the norm every last day in October. We knew which houses gave out the big candy bars. We knew which neighborhoods would be the most profitable. We didn’t know how toxic that bounty of candy really was to our growing bodies. It’s not just sugar we have to be afraid…commerical candy is loaded with toxic ingredients. Artificial Flavors – Made from cheap toxic chemicals derived from petroleum along with solvents, emulsifiers, flavor modifiers, preservatives that aren’t labeled, so you don’t know what you’re really ingesting. Artificial Colors – Also derived from petroleum, these dyes are linked to hyperactivity in children and some cancers. Caramel Color – The most common form is made from ammonia and contains the chemical 4-MEI which is classified as a possible carcinogen. Why add this to chocolate and caramel that is supposed to be naturally brown anyway? Vanillin – This artificial vanilla flavor is made from wood or petrochemicals. Partially Hydrogenated Oils – The main source of trans fat in our food that contributes to heart disease. It’s so harmful to our health that even the FDA has stepped in and is requiring companies to remove this ingredient within 3 years – but until then you can still find it in Halloween candy! Growth Hormones – Unless it’s certified organic, much of the dairy in chocolate comes from conventionally raised cows raised with synthetic hormones that are banned in other countries and linked to an increased risk of cancer in humans. PGPR (polyglycerol polyricinoleate) – A cheap emulsifier used to replace more expensive cocoa butter. TBHQ (tertiary butylhydroquinone) – The preservative TBHQ derived from petroleum that’s linked to asthma, allergies, and dermatitis. DATEM (diacetyl tartaric acid ester of mono- and diglycerides)– A dough conditioner usually derived GMOs that can be a hidden form of harmful trans fat. As parents, we don’t have to sacrifice our green, healthy standards even for one day. 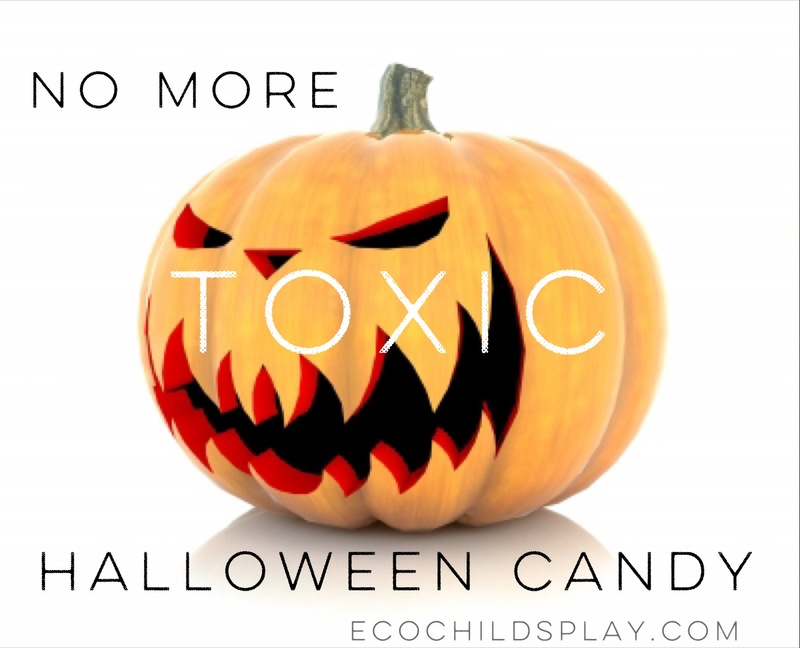 There are many organic, GMO-free candy alternatives to toxic Halloween treats. In our family, we have planted organic candy around the neighborhood so our kids get healthy treats. We have a small neighborhood, but for those neighbors we can’t reach or when our children go elsewhere to trick-or-treat, we practic a trade-in policy. We don’t trade piece for piece, but we allow our children to select some organic candy at the health food store, and then we give away the toxic candy to homeless. Ironically, even the homeless know the toxic commerical candy is bad. We have been rejected before, and I do feel some guilt in handing over food I will not allow my children to eat to those less fortunate. 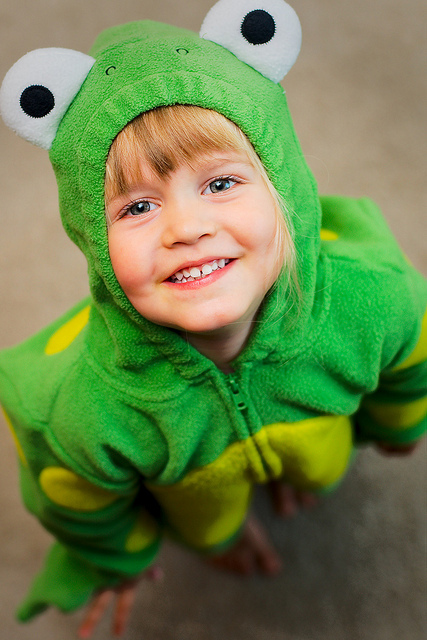 When our children choose, they pick out a toy or gift in exchange for the candy they have collected on Halloween. Our health is serious. We do not need to put toxic ingredients into our bodies even for one day. Commercial candy is filled with ingredients that are not natural and made from genetically modified organisms, these ingredients can lead to attention difficulties. In fact, the Center for Science in the Public Interest called on the Food & Drug Administration to ban artificial colors seven years ago! When I was a child, the scare with Halloween candy was that someone would slip a razor blade into it. We were told not to eat homemade treats or even accept fruit. Our parents should have been more scared of the toxi ingredients of the candy we were collecting and consuming. Although trick-or-treaters may be dissappointed, there are many candy alternatives to give out on Halloween. Pencils, stickers, toothbrushes, dried fruit, art supplies, etc. are all options. The children will get enough candy from other sources. Organic, gmo-free Halloween candy may be more expensive, but in the long run, the benefits to our public health far outweigh the intial cost. Less diabetes, disease, attention problems in school, heart disease, etc. can be averted with a healthy diet and excercise. It’s worth the extra expense! Please choose wisely this Halloween. Hand out healthy candy or alternatives; make trades with your children. Such eco consciousness, much humanity. Wow.